Erin O’Brien sits before me on a lovely sunny morning as we chat over tea. I have long admired her art and her company and I am grateful she is sharing how color and creativity help her glimpse spirit. Erin has always loved color. As a child she recalls seeing the colors all around her almost to the point of distraction. She describes a very early memory of smearing pastels together and delighting in how the colors beneath her fingers shifted and felt almost alive. Color for Erin has always been a source of inspiration and power. As a child, she always felt a bit different. She was sensitive and quite shy. As the third of seven children and the eldest girl, she was also a natural caretaker. Her connection to color and to the natural world around her helped draw her out of herself. She credits girl scouts and frequent camping trips as keys to grounding herself and gaining confidence growing up. Her artistic side and love of color guided her to study interior design. For over thirty years, Erin has helped many in the Chippewa Valley to bring color into their homes and businesses. In 2000, as a busy wife, mother and professional woman, Erin got a wake-up call in the form of optic neuritis. This painful condition causes temporary vision loss and can be a presenting sign of multiple sclerosis. This painful episode forced Erin to pause in her busy life. She realized she was being called to find herself again and take time to offer loving self-care to herself. 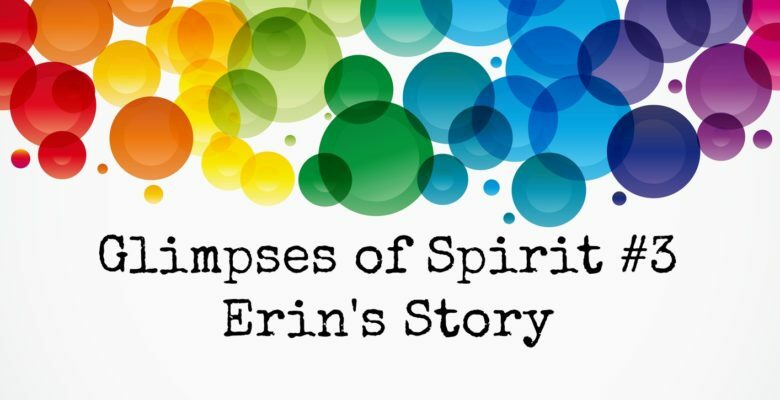 Erin began a to study different healing modalities and eventually found the chakras. This ancient healing system of color resonated deeply with Erin even if the Sanskrit mantras did not. The process of creating chakra art pieces while painting on silk assisted Erin in her own healing and growth. Thru diving in and learning how to paint on silk and later using technology, she began to blend and layer color much like her earliest memory with pastels. In the process of painting and layering, Erin found a movement and flow of energy and spirit in these pieces. She began to notice that this color and movement remained in the piece once it was completed. These layered, colorful pieces raised her energy and altered her mood in wonderful ways! Thus, her chakra energy art series was born. Connecting with your chosen creative outlet is surely a fun and beautiful way to glimpse spirit. Can you comment on the creative process Erin? “ I meditate while painting on silk and the breath is key. When I get stuck in a piece, I pause and take a few deep breaths. Instead of panicking about what needs to come next, the breath allows me to wait for the next thread. In that way, art is a great metaphor for life! Like so many people, I have a tendency to be overly busy and focused on all I need to get done. Taking a deep breath and gazing on these pieces has helped me to respond more to life rather than reacting like a ping-pong ball to it! 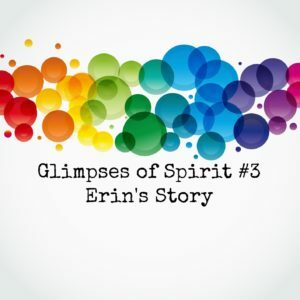 What does glimpsing spirit mean to you Erin? Do your art. Be open to what comes thru you. The more you do this, the more your art will reflect this connection. Find your tribe. As I move forward, I am finding that the people I am drawn to understand and support my art! May it be that way for you as well. Joy in my art is mixing and blending new things. Challenge yourself to learn new things and don’t be afraid to go back to the basics. Returning to the basics again and again helps me to grow. I am not stagnant. I am moving just like my energy art is moving and that is a wonderful thing! ~First chakra- Root- Red- I am grounded. I nurture my body with clean food and water. I exercise and relax. ~Second chakra- Sacral-orange- I AM passionate. I experience the present moment through all my senses. I express myself in a powerful way to manifest my hopes and dreams. ~Fifth chakra-Throat-Sky blue-I AM strong. With spoken word, I express my truth with ease. ~Sixth chakra-Third eye-Indigo-I AM enlightened. I am wise, intuitive and connected with my Inner Guide. I connect with the wisdom of the Universe. For more information on Erin’s beautiful artwork, to purchase a piece or take a class from her, please check out her colorful website: www.erindesigns.com. Thank you Erin for sharing. Your art is so beautiful. It truly is a reflection of yourself. Thank you for taking the time to share this piece of your story and art. I have learned to appreciate the chakra energy through you and your art. The few classes of art at Y camp was my only experience sitting in on one of your classes. You definitely are on of my very favorite artists. You are beautiful, keep teaching, painting and growing.